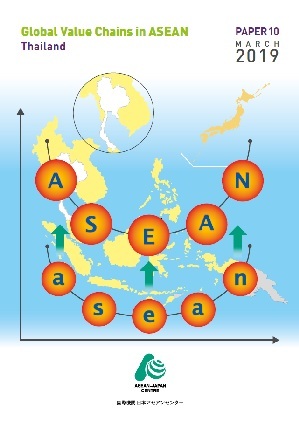 A study on Global Value Chain (GVC) in Thailand issued by AJC. The Centre’s database of global value chains is on value added export data. Unlike trade data on custom-clearance basis or on country of consignment basis, value added trade data are compiled based on value added creation. In other words, trade value in global value chains indicates the value created by and attributed to a specific country and a specific industry. Therefore, each value of exports is attributable to a certain country (not necessarily to the country of shipment) and to a certain industry (not necessarily to the industry of the product). Trade in value added can be estimated based on international input-output tables. There are several initiatives undertaken to estimate value added trade, including and not limited to OECD (Inter-country input-output model), World Input-Output Database (WIOD) and UNCTAD-Eora GVC Database. AJC’s database is based on UNCTAD-Eora GVC Database. AJC data on GVCs particularly focus on ASEAN and its dialogue partner countries, though it also covers the entire world. Value added trade data are all estimates. Therefore, different initiatives in this respect have produced some differences in estimated value added trade. However, all of these initiatives point to the same trends and direction of GVCs. Nevertheless, it is strongly recommended that in using the data on value added trade or GVCs in this database, utmost careful attention should be paid to the data. The Centre does not guarantee the correctness of data nor take any responsibility for wrong conclusion of policymaking that is derived from the analysis using the data contained in this database. This database is frequently updated. Therefore, data contained in this database may differ somewhat from those used in Centre’s publications on GVCs. When using or quoting data contained in this database, please acknowledge the ASEAN-Japan Centre or AJC-UNCTAD-Eora database on ASEAN GVCs. Foreign value added (FVA) indicates what part of a country’s gross exports consists of inputs that have been produced in other countries. Domestic value added (DVA) is the part of exports created in country, i.e. the part of exports that contributes to GDP. The sum of foreign and domestic value added equates to gross exports. Value added incorporated in other countries’ exports (DVX) indicates the extent to which a country’s exports are used as inputs to exports from other countries. At the global level, the sum of this value and the sum of foreign value added is the same.